WAVERLY, WV Horse training is a mental game played in a physical medium. Here at Meredith Manor, we use a system we call heeding to teach students the rules of the mental games they play with their horses. They learn how to use corridors of methodically applied, horse-logical pressures to show, ask, and eventually tell their horses what shapes they want them to take. They also need to methodically develop their horses physical abilities in order to play whatever game theyve decided they like whether its dressage or reining or jumping or cutting or whatever. Like any athlete, a baby horse needs to learn how to use his body the right way. He has to find his balance. He needs to build his muscles, his strength, in order to play our games. If a student came to me and asked for advice on how to develop strong stomach muscles and I told him to start doing 200 crunches daily, his muscles would be pretty sore after the first day. He might be mentally sore at me, too, and probably disinclined to listen to any more of my advice. But if Id advised him to do 20 crunches for several days, then to add another 10 for several days, and then another 10 and so on, he would eventually get up to that 200 a day without getting so sore he be discouraged. Its the same with a horse. He has to build his muscles gradually in order not to get sore and discouraged and disinclined to listen to his partner. We help him build the muscles he needs by taking him through a sequence of physical skills that build on one another. 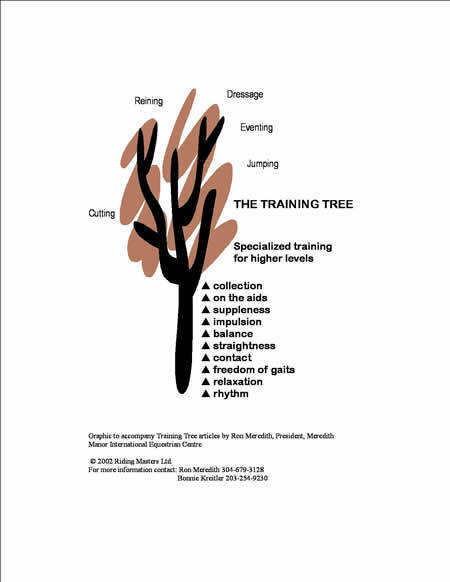 Years ago someone (my apologies to them, wherever they are, because I cant remember exactly who it was) introduced me to the concept of a tree to explain just how physical skills have to build on one another to create a strong foundation before the horse can specialize in whatever game his trainer wants and be successful. Once the horse has developed a strong trunk or foundation, he can branch out into any kind of specialized training you want (see drawing). Theres a definite sequence to the skills the horse has to master. If you try to skip one, youre going to leave a hole in that horses physical conditioning that will catch up with him when he tries to play games at the higher levels. The driving horse that never learned to seek contact between the bit and his drivers hands is never going to have good impulsion. The reining horse that never learned to move straight isnt going to be able to spin worth a darn. The dressage horse that isnt balanced will never be truly on his riders aids. Everything starts with rhythm. That means the horse moves with steady, even footfalls. Then hes got to be relaxed physically. Hes got to be swinging through his back and neck. There cant be any tension in his jaw or his poll or his back or anywhere or he wont be able to move freely. Moving freely means the horse is reaching forward with the hip and shoulder without any resistance in his own body or any resistance from the rider. Learning to carry a riders weight is hard work for a baby horse and sometimes the best thing a rider can do is just not interfere while the horse figures it out. Once the horse has figured out how to carry a rider, he should start seeking contact. Hes swinging along in a relaxed and rhythmic way and now we want him to stretch his neck down and out a little to find a steady, elastic connection between the bit and his riders hand. Once the rider has that contact, she can start asking the horse to move in a straight line. The horse can move straight on a straight line or a curved line. What we mean is that the hind foot on one side is following the same track as the front foot on that same side. Hes not moving his hind legs to the inside or outside, hes just tracking along. Now hes ready to start some serious body building. Everythings in place so that he can start to develop all his muscles more or less equally. We want the horse to become balanced. Horses generally carry about 60 percent of their weight on their front end. Some horses are more balanced than others and some horses carry so much of their weight on their front end that balance is going to be a tough deal for them. But Nature built horses with rear wheel drive and a horse has to learn to carry more of his weight to the rear if hes going to jump a bigger jump, or do a longer slide, or do a better canter pirouette. As he shifts more of his weight to the rear and become more balanced, the horse gets stronger in his hindquarters and he can start moving with impulsion. He develops power, some engine thrust. Now we want that power but we dont want the horse to be stiff when hes thrusting forward. We want him to keep his joints loose while hes bending them, to stay supple. As he puts all of this together, he starts to have enough physical conditioning to stay on his riders aids which means he can listen to and respond to his riders corridors of pressure for a period of time without losing his balance or relaxation or rhythm or whatever. The final stage of his physical conditioning comes when he can collect himself up, bend his hocks even more, lower his hindquarters and move like a super athlete. Theres no such thing as an average horse but, on average, figure at least two years to bring a baby horse through this basic training tree sequence. The first year, hes just going to be learning how to carry the riders weight with rhythm and relaxation and to move forward freely, on contact, in a straight line. Then he spends the second year in serious body building so he can carry himself in balance, with impulsion and suppleness. The ultimate is when hes got it all together enough to stay on the aids and eventually become collected. Now youve got an equine Schwarzenegger. The great thing about the training tree is that it works as well for older horses as it does for bringing along baby horses. If you get an older horse thats having a problem, you start him at the bottom of the tree and work your way back up. When you get to the level he cant perform, youve found the root of his problem and you can work on it. The training tree is physically horse logical just as heeding is mentally horse logical. So it works.